Chez Albert project is carried out on a proposal of La Semeuse in the context of a residence at the Laboratoires d’ Aubervilliers. – Yes We Camp was born during the Camping Marseille 2013 project (an artistic and alternative project of ephemeral base camp that was built in 2013 on the banks of the Lave à l’Estaque). It is a multidisciplinary group constituted of architects, engineers, botanists, urban planners, artists, gardeners, handymen, designers, etc. These different actors gathered to create a laboratory for urban forms of nomadism, with travelers coming from all over to settle temporarily in the city’s public space, intuitively searching for enjoyable new ways of living multi-place lives. – La Semeuse is part of The Laboratoires d’Aubervilliers (art center). 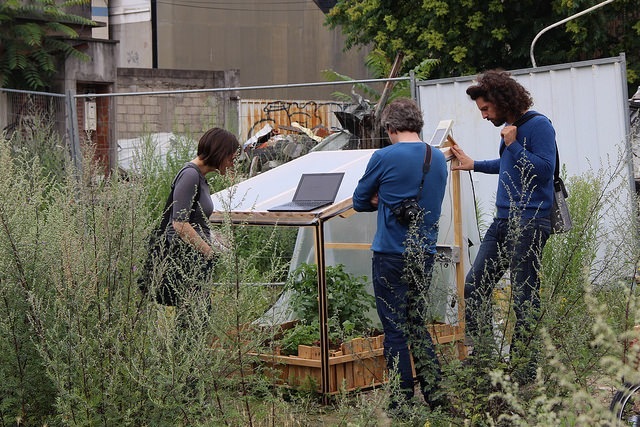 It was born from collaboration between the artist/architect Marjetica Potrc and Severine Roussel, Philippe Zourgane, both architects in Aubervilliers intended to connect plant biodiversity and cultural diversity of the city. Currently coordinated by Ingrid Amaro, in 2011 the project was developed by landscaper : Guilain Roussel and Margaux vineyard. La Semeuse got the support of the Regional Council of Île-de-France, department of Seine Saint-Denis, CAF (Family Allowance Fund) of the Seine Saint-Denis, the ACSE (National Agency for social cohesion and equal opportunities), the city of Aubervilliers, Lapeyre and the Fondation de France. Jean Barthelemi Debost / Director of Partnerships and network service of the Museum of history and immigration . Alexandre Bouton / Architect and urban planner who has conducted a study on the establishment of a network of gardens in Aubervilliers. Cyclofficine de Pantin / Workshops cooperative bicycle the Île-de-France . Les Vélos de la Brèche / Association whose will is developing practices and bicycle use in Aubervilliers, implementation of self-repair workshops and bicycle recycling . MaxiJu / Actor-storytellers, set up shows. l’Association Villes des Musiques du monde (Cities World Music Association) / Setting up musical evenings. The transformation of an old wasteland into a cohabitation space for various events (musicals evenings, workshops for self-repair), questions the ways of involving citizens in the design of public space. The goal is simple : to emerge collective uses and succeed that this space of 3000 m² is appropriate and used by locals, after the destruction of existing buildings and before the construction of new buildings. Chez Albert questions the future uses of this wasteland but also the mission of the inhabitants. It suggests new urbanity (meeting place, mutual aid, friendliness, etc.). The major goal of the project is to imagine participative process. Concerts, shows, table tennis tournament, as many low-cost applications for communities and able to create spaces for cohabitation.